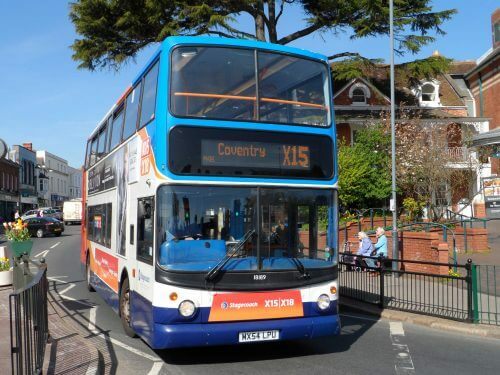 Midland Red (South) Ltd, trading as Stagecoach Midlands, has been fined £2.3m for failing to heed warnings about a 77-year-old driver who would go on to cause a fatal accident. Former mayor Kailash Chander, now 80, mistook the accelerator for the brake back in October 2015, sending his double-decker into a nearby Sainsbury’s at speed. Seven-year-old passenger Rowan Fitzgerald and 76-year-old pedestrian Dora Hancox both suffered fatal injuries in crash, and were pronounced dead at the scene. Midland Red (South) pleaded guilty to two offences contrary to the Health and Safety at Work Act – admitting it allowed Kailash to work over 70 hours a week. The driver had been involved in four crashes in three years, a fact-finding trial heard in September, and had previously been warned about his ‘erratic’ driving. The company admitted it was also aware of his dangerous driving, yet allowed him to continue working. Kailash was deemed unfit to stand trial due to dementia, but received a two-year medical supervision order at a recent hearing at Birmingham Crown Court. He may have been suffering from undiagnosed dementia in 2015, an expert told the court, with his barrister explaining that he now requires full-time care having been ‘traumatised’ by the crash. Explaining the new measures the company has introduced since the accident, Managing Director of Midland Red (South), Phil Medlicott, said: “These include more frequent medical testing and a pre-medical review for older drivers, with appropriate checks being carried out every six months rather than on a statutory annual basis. “We have put in place stronger measures to control working hours and have improved communications with our operational teams.